Are you prepared to vote consistent with your faith on Election Day, November 6th? Find out where candidates stand on important issues like life, family, and religious liberty using Minnesota Family Council’s 2018 Voter Guide! View major candidate positions for all statewide races, Congressional district races, and state legislative district races in one document. Click HERE or on the image below to get the Statewide Voter Guide! When you enter your name, address, and email, you’ll instantly receive a mobile-friendly Personal Voter Guide featuring positions for candidates running in your district. In both versions of the Voter Guide, ANSWERS ARE COLOR-CODED, so make sure to print in color if you decide you'd like to bring a hard copy with you to the polls. Otherwise, the Personalized Voter Guide is mobile friendly! 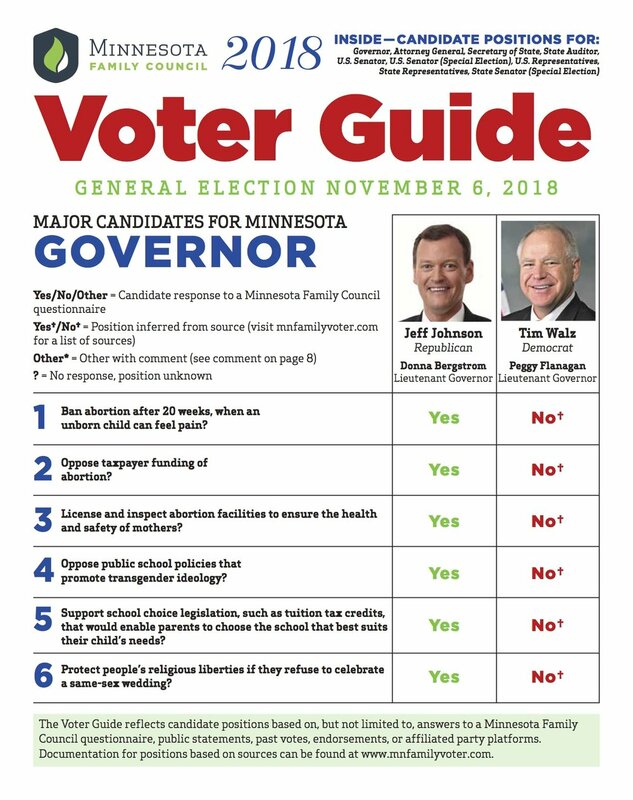 The Minnesota Family Council 2018 Voter Guide reflects candidate positions based on, but not limited to, answers to a Minnesota Family Council questionnaire, public statements, past votes, endorsements, or affiliated party platforms. Documentation for positions based on sources can be found on each candidate’s page at www.mnfamilyvoter.com. This 501(c)(4) Voter Guide was prepared and paid for by Minnesota Family Council - 2855 Anthony Lane South Suite 150, Minneapolis, MN 55418. For many more election resources, visit www.LightsOnMN.org.